Unfortunately she lacked the vocabulary to express herself properly. I suspect that Sarah was trying to say the word “caricature” when trying to discuss how reporters picked up on her “I can see Russia from my house.” statement. I can’t pinpoint the expression that flashed across her face when she tripped over her words. Anger? Embarrassment? Was she pissed at Katie? It definitely wasn’t perkiness. And turning away from Katie at that moment was not positive body language. Sarah also used her time with Katie to further expand her muppet hands repetoire. Regarding her hair, I think Sarah’s now going for the “Peggy Hill Meets a Mullet” look. Pink is still not her color. 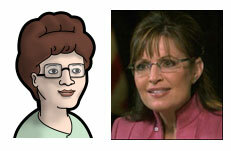 Next Entry: Sarah Palin and Peggy Hill Are Not Scared of the Economy. I Think.